Why does the app use so much memory and why does each different language require downloading a separate app? The Universe2go app contains a huge database, which gives you the entire night sky and includes countless objects, images and audio information. This means the app takes up a lot of memory, but also that it is completely independent of any mobile phone network – as, if you are observing from a high mountain, a desert or from some another remote location in the world, you will often have no connection. The advantage: Universe2go will always work. There are no fees and, of course, no roaming charges when abroad. We have released the app in separate language versions, in order to avoid too large a file size. How do I align my smartphone in the passe-partout? The passe-partout is made up of four different corners. The position depends on the size and model of your smartphone. Make sure that the screen is arranged as centrally as possible. Many Samsung models have a button on the side. You should therefore preferably position the small corners at the bottom or on the right hand side of the button, to avoid accidental operation of the button during use. In some cases on very large smartphones only the large outer frame of the passe-partout can be used. In such a case you must simply do without the corners. Do I have to remove my smartphone from the hand-held planetarium to choose another mode, like Deep-Sky or Mythology? No. You can control the app Universe2go without having to touch the screen of your smartphone. This is made possible by a new control technique via the sensors of your smartphone. Can I stop the Audio Guide whenever desired, or do I always have to listen right to the end of the explanation? If you do not want to listen to the explanation right to the end, just simply shake the Universe2go viewer lightly. The Audio Guide is then quit and you can focus on the next constellation or object. How can I listen to the audio introduction of Universe2go, even after the initial use? If you are using an iPhone: Under iPhone settings you will find various apps. Choose the app Universe2go. The settings menu of Universe2go will then appear. Under item “General → reset Audio-Help” move the control button to the right. If the control button appears in green, the Audi-Help function has been activated again. Now restart the App Universe2go. What should I watch for in the new Star calibration? To align your hand-held planetarium with the night sky, you will first have to point it at three different bright stars. In contrast to earlier versions of the app, where you only needed one star, the precision has been significantly improved and objects are easier to recognize. After successful calibration, a tone will sound and you will receive a brief message regarding sensor quality. 3 seconds later Universe2go will automatically change to a view of the night sky. Note: You can abort the star calibration by shaking the device. However, this may adversely affect alignment. If a calibration turns out to be inaccurate, one reason may be heavy interference affecting the magnetic sensor. In this case, the compass will show a large deviation and stars will not be reliably aligned. The fine adjustment evaluates about 1000 sensor readings and corrects the compass interference. Proceed as follows: Select the menu in the view of the sky and scroll down to ‘Settings’. After selecting ‘Settings’, you click on the option ‘Compass fine adjustment’. You will see brief schematic instructions for carrying this out. In order to collect as many sensor readings as possible, turn in a circle while pointing the unit alternatively at the ground and then at the sky. A tone will chime if sufficient sensor readings ​​have been detected. You do not need to look through the device during this procedure. If you are already familiar with the night sky, then expert calibration is the correct choice for you. Point at a known bright star or planet, or at the Moon. The app assumes that exactly this object is located in the targeting circle. The precision of the app can hence be increased even with an inaccurate compass. What shall I do, if the star calibration is lost during use? Carry out the star calibration again. You can start this in the app under “Settings”. Follow the instructions in the manual for star calibration. What do I need to bear in mind when calibrating my iPhone? The Universe2go app also uses the compass and gyroscope in your iPhone. It is important that these sensors are switched on and that they are operating reliably. It is equally important that when using Universe2go outside, you stay away from buildings and metal objects. In order to optimally prepare yourself for using your iPhone together with Universe2go, take a look at this blog. How do I adjust my personal intraocular distance? And why is this important? You should adjust your own intraocular distance to adapt your hand-held planetarium to your personal needs. 2. By measuring and entering the intraocular distance: Use the PD-ruler to measure your personal intraocular distance and enter the measurements separately (currently only for Android). Why is it better to measure the intraocular distance? The intraocular distance (or interpupillary distance) describes the distance of the pupil centre to the bridge of the nose. When looking through an optical instrument, both eyes should work together. Only when this distance is correct, can you enjoy relaxed viewing and optimally utilize the ability for stereo viewing. This measuring method enables accuracies of up to 1mm. Your advantage: The eye does not need to make any compensating movements and you can enjoy relaxed, far-distant viewing. And this even over a longer period of time. The Universe2go hand-held planetarium shows you the 3D-images in especially high quality. Overall, this method once again enhances the fun of observing. Your PD measuring ruler is available here for downloading. Can I change the contrast of individual elements (like e.g. constellations)? Yes. Please open the settings menu of Universe2go. 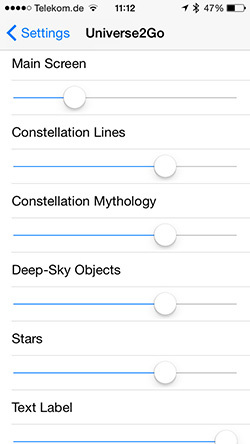 Under the item “Brightness settings” you will find the options: Screen, Constellation Lines, Constellation Mythology, Deep-Sky Objects, Stars and Text-Label. Each element has its own slide control from dark to bright. Simply try various possibilities, until you have found the most suitable settings. How shall I clean the Universe2go viewer? The mirror should, under no circumstances, be cleaned with a cloth, it may be cleaned with compressed air. However, dust does not cause a disturbance, because the magnification is only 3.5x. The screens (polycarbonate) may be cleaned with a very soft cloth. Do not use any detergents. HOW DO I CONNECT THE OMEGON BLUETOOTH HEADSET WITH MY SMARTPHONE? Switch the headset on for the first time using the square button. The LED will flash alternately red and blue. Now, you must switch on the Bluetooth function of your mobile phone. Your mobile phone should find a Bluetooth device called “HS-06”. After selecting it, your smartphone will connect to the headset and instead of hearing through the device speaker, you will hear everything through the headset. If a code is requested after activation, type in “0000”. If everything has been successful, you should hear “pairing successful” via the headset. The headset is delivered with a USB cable. Plug the small end of this cable into the USB port of the headset for charging. Plug the other end into a PC or another source of power with the USB connector. This is how you charge the headset.